Hoppy Paws, the stamp kits that create realistic Holiday Character prints in a safe, non-toxic, biodegradable chalk paint. Featured on Shark Tank, their episode is actually re-airing Saturday, May 16th! Tune in if you can. :) With the success of Hoppy Paws, they are expanding their line to include adorable stories and plush companions. Each story depicts how the Holiday Character received their magical footprints, teaches a valuable life lesson and comes with a cuddly sleeping companion. By the way..... They are the ONLY Company in Shark Tank history to close a deal for DOUBLE the money asked for with ZERO money in sales! Nothing warms parents’ hearts more than seeing the look on their children’s faces when they discover evidence that the Tooth Fairy has visited their home—especially when that trail of wings ends under their pillow with the loot! Looking for a sweet way to make her baby shower extra special? Add a whimsical touch with Stork prints leading the way to the celebration. Or as guests and well wishers come to the door to meet the new bundle of joy, they’ll get a giggle when they see that the Stork has been there! All prints can be placed on most outdoor and indoor surfaces. The best part is they wash off using only water-no mess, no fuss! Created over 20 years ago to start her own family tradition, Trina Barkouras made paw prints to delight and thrill her own children. She then started to make them for friends and family as well. Hoppy Paws was born. 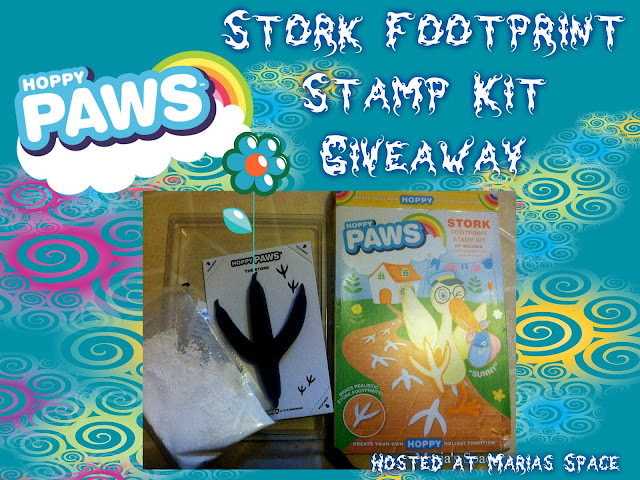 Now, Hoppy Paws stamp kits are available at several retail locations. In addition, Hoppy Paws stamp kits can be purchased at www.Hoppypaws.com. Each kit is $6.99 plus shipping and handling. This kit is perfect for helping families perpetuate the childhood magic that is so short lived. It is one of the best things about a child and honestly a parent. I love trying to recreate the magic I had a child and this kit makes it so easy. Each kit comes with powder, stamper and a tray. Simply take the powder and mix with water. You want it to be the consistency of paint. Then you dip the paw print in the mixture and put it on whatever flat surface you want. The box says to let it dry for 20 mins. Get rid of the excess and let the magic begin! Clean up is easy as well, just a damp sponge or cloth and it your surface is as good as new. The kits are easy to use and priced right! Start your own holiday tradition and get ready to see some big smiles from your kids. Creating magic and memories is our job as parents and Hoppy Paws is the perfect parent companion. Disclaimer: I received a complimentary kit for my honest opinion. No monetary compensation was offered or received. Santa's Reindeer Hoof Print would be fun for my sons. I think I would buy the Tooth Fairy Wing Kit! Tooth Fairy Wing Print or the Santa one. I would love to get the Santa's Elf Footprint set for my grandson.